The state has offered to make future Interstate 405 tolls a bit less painful by waiving the $15 cost of a transponder that carpoolers must stick on their windshields. The state is offering to make future Interstate 405 tolls slightly less painful by waiving the cost of a $15 transponder that carpoolers must stick on their windshields. Sometime this fall, both the existing high-occupancy-vehicle lane and a newly built lane in each direction will become a pair of “Express Toll Lanes,” where buses, van pools and carpools of at least three people can travel free at peak times and zip past general traffic. Solo drivers and two-person carpools must pay, or use the general lanes. The Washington State Department of Transportation announced the transponder promotion Monday in downtown Bellevue. The new toll system has angered some drivers who will lose their free access for two-person carpools. The WSDOT encourages them to upgrade to three people. “We just want riders to be ready,” said toll spokeswoman Patty Michaud. Other options include splitting the cost of tolls between two commuters, changing to transit or taking general lanes. 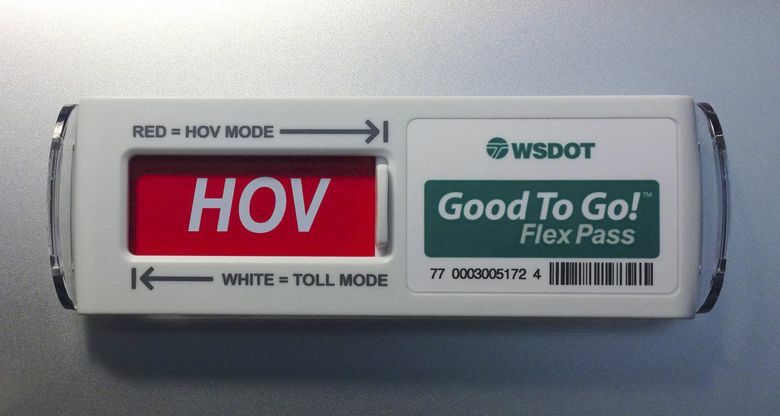 The new transponder, called a “Flex Pass,” has a manual switch so that a driver may choose either the green “TOLL” option, or the red “HOV” option when seeking to use the new lanes toll-free, between Lynnwood and Bellevue. Tolls will typically range from 75 cents to $4, but could hit $10 during extreme congestion. The plastic, candy-bar-sized devices normally cost $15. But that fee is waived for drivers who log onto rideshareonline.com, navigate many steps and attest through survey questions that they currently carpool with at least two people at least once a week. Off-peak, a two-person carpool can use the Express Toll Lanes by flipping a FlexPass to the red HOV position. Tolls are assessed using overhead cameras and detectors, instead of old-style toll booths. “You’ve got to have a Flex Pass to use the Express Toll Lanes toll-free, even if you have a carpool,” Michaud said. Enforcement will be done by state troopers who see a pass flipped to red and will look for at least three people, at peak times. These and other changes will undoubtedly confuse thousands of freeway users, who risk fines of $40 per trip, in the event they fail to pay a toll bill that comes in the mail. Besides the drivers, some 7,650 bus riders per weekday travel in the northern half of I-405, but the lanes are often too clogged to move at least 45 mph, the state standard. Most of the toll income will go to administer the system, buy equipment, and pay Texas-based Electronic Transaction Consultants to handle the billing. Craig Stone, state toll director, said the I-405 tolls are meant primarily to ensure congestion-free lanes for people when needed, as opposed to paying for the freeway widening. 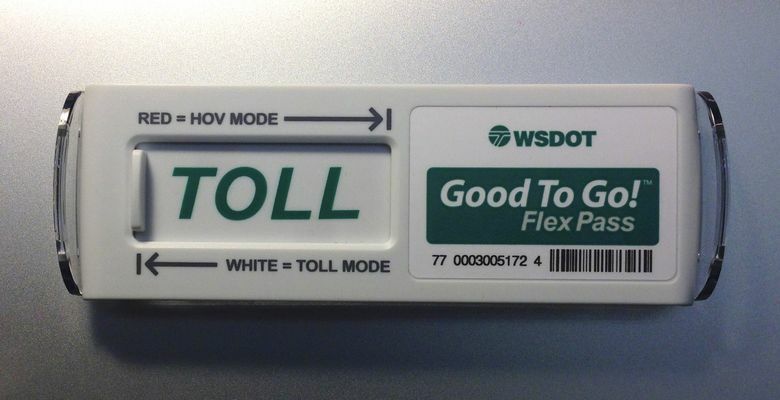 The Flex Passes also are usable on Highway 167 from Renton to Auburn. The state has ordered 100,000 Flex Passes for this year’s sign-up blitz, Stone said. By comparison, some 450,000 vehicles per weekday use the Bellevue-Lynnwood half of I-405.